Andrea Fella has been practicing insight meditation since 1996 and was quickly drawn to intensive retreat practice. 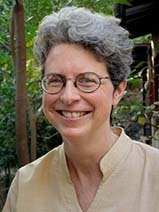 She has done a number of long retreats, both in the United States and in Burma. During one long practice period in Burma, she ordained as a nun with Sayadaw U Janaka. Andrea is the co-teacher with Gil Fronsdal at the Insight Meditation Center and Insight Retreat Center in Redwood City, CA. She is also a member of the Spirit Rock Teachers Council, a core faculty member for the Dedicated Dharma Practitioners Program at Spirit Rock, and teaches residential retreats at Spirit Rock, IMS, and other retreat centers around the country. Andrea is especially drawn to the wisdom teachings of the Buddha. Her teachings emphasize clarity and practicality.